Here we go with another ponzi scam with cryptocurrency "training". A bogus product to disguise the ponzi scam! succeed in the world of crypto-currency. By joining the One concept, you not only get the best online training on how to profit from crypto-currency, but moreover you position yourself in an unlimited revenue generating program, providing you with all the tools you need to succeed. Our training and marketing tools combined with a solid and strong educational product, enhanced by an outstanding payment plan, is why today’s entrepreneurs are joining the One Concept. We are committed to make you successful – and will provide all the support you need to grow your team and business. Born in 1976, on the 26th of December, Sebastian Greenwood developed into a strong leader when it comes to business implementations, having occupied two manager-type positions, as well as two CEO ones in the time-span of only ten years. Welcome to RS. So you want us to believe that the link to the company website is the truth and provides "proof" that this is a real and legal program? Seriously? Just a few questions for you. Why aren't the founders listed on the website? Not one word about any of them and their bio's. So how do we know what you have posted about their identities and credentials are in fact true? All we have is your word this information is true. You see the link you provided for John Ng, Dr. Ruja Ignatova, and Sebastian Greenwood is nothing more than a link to the company website and not one word is provided about these people as previously mentioned. But for targeting Europeans, at least they chose the right word because targeting them is what they are doing, or any other geographical region for that matter. But your information provides the "truth" about onecoin falls way short of even coming close to proving anything. I think Wong Lee is saying that OneCoin is a scam. Yeap, guys try to understand what a person who does not have good english skills is trying to say, before attacking him. The split barometer at OneCoin is now at 98% !!! When it reaches 100% your investment is doubled. This is the easiest way to double your money there is ! And the doubling will happen now. Then your doubled investment will continue to multiply in value. You can become stinking rich very very fast. Sign up and upgrade/get your package right now ! I would agree that OneCoin is a scam. I had the chance to look into this company and it is a pyramid scheme disguised as a digital currency. The president of this company was kicked out of the company at the start of this year. I had a chance to review some of his comments about the company on Facebook and he viewed it as a giant fraud. Some good reviews over at Oz's place, including the paid Forbes cover they trying to pass off as real press. Ruja Ignatova's OneCoin Forbes cover a paid advertisement? Ribshaw, this is the auditing firm, apparently. I won't post any more so as not to disrupt this thread on UFUN. I emailed Semper Fortis and suggested they have their legal department look into the Ponzi scam claiming to be a client. Those less cynical about Zerocoin's claim might contact SF and request copies of any work. Certainly with nothing to hide and all legal requirements met this is available to potential investors. Pretending ZCers that an audit was done, important to know what type was completed and for whom. Most audits are not done to detect fraud and those that are generally detect internal fraud. Seldom if ever would a third party auditor be engaged to prove to the public that something wasn't a scam. Although in the case of Bernie Madoff the auditor was complicit in the scheme so there's always that. Without even looking my guess is this charade is funded via a payment processor in some island nation. If the auditor was attesting to actual funds held at major financial institutions and the veracity of ZCrs back office balances that would shocking surprise. End of day I suspect no auditor and little difference than tossing money down a rat hole. It does warm the cockles of my heart to see Jon asking for something beyond payment proofs and fakeo Forbes covers. That guy asks the best questions. Last edited by ribshaw; 05-30-2015 at 08:50 PM. 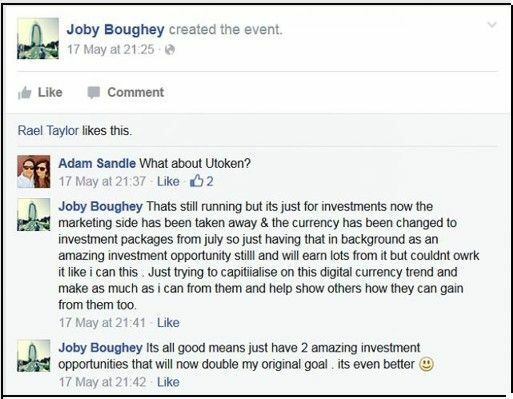 Our old friend, Joby Boughey (pushing UFUN/UTOKEN until, cough, recent unfortunate events in Thailand) has jumped onto Onecoin in a big way. On 6th June, he is holding a special event to rope in the suckers.....I beg your pardon, so sorry; to promote it. I wonder if the lovely Claire Hartman James will join in with this one? She followed Joby into UFUn after all; although she has since purged her FB page of all reference to it. Oooh, look, an advertising hoarding, it must be real! Important: After you send your wire, make sure the bank gives you a wire confirmation receipt document. I like the part where Joby says he is at "work at min", always nice to have a boss that gives you to time promote Ponzi schemes on the company dime. inorite? how can he be at a job? he's a successful scammer entrepreneur. allegedly. jobs are for suckers and people that actually want to make money. The video is hilarious, by the way. Love the part where he takes off his boots and throws them away because he's "never going to be on a building site again". Think you might have been a bit rash there, Joby, darling. shipdit, Della Cate and sibbits like this. Templates again. These scammers haven't had a bright new idea in decades. Whip, littleroundman and Della Cate like this. Here's a nice little video with the report from the auditor. You might want to run to about 4 mins in, because the first bit is all prattle about who they are. But as it is only 10 mins long, it won't take up too much time. I'm rather hampered because I do not know what a "blockchain" is or why it is important. The lady in the gold dress is presumably Dr Ruja, the founder? I'm rather hampered because I do not know what a "blockchain" is or why it is important. Just checked my email and have not heard back from the auditor despite assurances in the video. Although I must confess I am surprised they really engaged an auditor even if for such trivial nonsense. The "blockchain" in its simplest form is a list of transactions, in the case of this video 15,000 buys and sells. So I have a ZC and trade you for an apple. You take my ZC and buy a banana from LRM. LRM takes his ZC and buys a pear from Whip. An audit of the blockchain would confirm that happened. I could go down to the elementary school and trade worthless baseball cards for kid's lunch money. The kids could trade the worthless cards between themselves to their heart's content, in the meantime I have real money. Sending an auditor to track the transactions of the children would be identical to what Dr. Ruja has done, and about as useful. shipdit, Joe_Shmoe and Della Cate like this. I find it hard to fathom that OC ever rates as a cryptocurrency, much less gains acceptance by big businesses that call the tune in world currency markets. A few hippies trading dream catchers will not negate the reasons the world has organized exchanges. Concerns such as minimal counterparty risk trump MLM, OC sets markets back 100 years. We are no longer trading tulip blubs, cabbage patch kids, or beanie babies. The Onecoin market ends the same, and will be lucky if it even rates a footnote in history.